If you’re after a complex and tech-packed GPS, this isn’t the device or the review for you. We’ll keep this review straight to the point since that’s the approach of the Bushnell Phantom. It’s one of the latest golf gadgets from Bushnell to hit the green, an update to the now discontinued NEO Ghost GPS. It’s simple and yet advanced, and it’s as inconspicuous as you want it to be. It’s completely tournament legal, so you can have your distance tracking device with you throughout competitions. 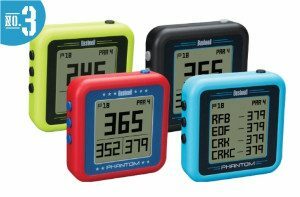 As is standard for Bushnell, the Phantom has 36,000 plus preloaded courses from around the world. The Phantom can automatically pinpoint the course you’re on and will automatically move from hole to hole with you as you find your way around the course. To prevent you from landing knee-deep in sand or having to send your knickerbockers in to the drycleaners, you’ll need the distance to your hazards. The Phantom can cycle through up to four hazards at a time. The handheld GPS unit is small. It barely weighs anything at 52 grams/1.8 ounces – what? Yes, it’s tiny. The screen size might only be 1.4 x 1.4 inches on the 2.3 x 2.3 inch size face, but that’s what makes it so easy to have and carry around. Just be sure not to lose it. Losing it is even harder now with the nifty magnetic system Bushnell outfitted the Phantom with. It’s the next biggest technology to come to handheld GPS devices, and we’re sure other manufacturers are going to catch on. But, Bushnell seems to be the culprit of introducing this bite magnetic technology first. The user interface requires little effort from the user. Just ensure you’re on the right course and you’re good to go. It will display everything you need with distances to the front, back, and center with enough juice to get your through two games. It’s time to put down the phones and time-consuming gadgets and get back to the sport at hand. Get your distances, keep your head in the game, and keep your spikes out of the pond scum with the Phantom. How does the Bite Magnetic Mount Technology Work? Will the Phantom Stay Secure to the Belt Clip/Golf Cart? The biggest complaint about the magnetic system is its strength. The belt clip is said to be too small, and some have suggested they would use a much bigger clip and glue it to the device. Accidental brushes of the hand against the Phantom have dislodged it from the belt clip. Others have said when attaching the Phantom to a golf cart that it tends to slide down when going over bumps. But, many others have said that it holds up just fine. Proper care and maintenance will ensure the bite magnet remains strong and undamaged. Exposing the device to extreme temperatures like leaving it in a hot car can cause it to lose its adhesive force. Is the Bushnell GPS Accurate? Some Phantoms aren’t as accurate as users would like them. If the unit is way off, it may be defective. Most users say the Phantom is very accurate, but it’s wise to remember that distances within a few yards of the true distance is considered acceptable. Is the Golf GPS Phantom Waterproof? The Phantom is only IPX4 rated, so it’s essentially water-resistant, but it is not waterproof. What Languages are Available with the Bushnell GPS? This GPS device has five language settings: English, French, German, Italian, and Spanish. It’s set up in English by default, but it can be changed by accessing the Language Menu in Settings. Battery life is 10 hours. Generally, it’s assumed it will last two rounds. However, this is subjective depending on speed of play. Charging time takes four hours. 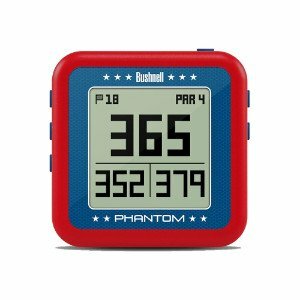 Can the Phantom Connect to the Bushnell Golf App? 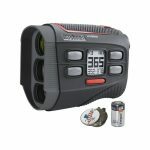 It does have Bluetooth technology to connect with the included access to the Bushnell Golf app. Does the Golf GPS have Auto-Off? Are there any User Fees, Memberships, or Subscriptions? Bushnell requires no fees, memberships, or subscriptions. There are no hidden charges. Access to the Bushnell Golf app is included with purchase of a Bushnell golf device. To ping up the strokes, the Phantom offers the new bite magnet mount technology to make it easier to churn out the course without fear of losing your distance tracker. With distances to the front, back, and center, the only other thing you need is skill. But, judging by your handicap, you may need a little more help than what the Phantom can dish out. The Garmin Approach G8 has wi-fi, slope distances, club recommendations, and a 3″ touch display. Expect a huge jump up in price, but it might improve your stroke. 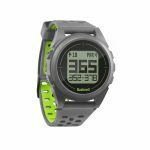 But, if you’d prefer to wear your golf GPS unit, and you’re not sold on the bite magnet, the Bushnell Ion 2 golf GPS watch should be a sure bet. It’s tournament legal, has a 12-hour battery life, and a few, extra features. It’s a watch you’ll want to wear on the course. Who knows, maybe it’ll do for everyday wear as well! If you want stat tracking, club recommendations, and step counting features, you’re asking for a whole lot more, and you’ll have to check out our other GPS recommendations. But, if you want to get lost in the game versus lost in figuring out how to master your device, the Phantom makes it easy. Get back to the sport and the joy of it – that’s what counts!